November 9, 2010..."Don't follow leaders, watch the parking meters", was playing on my headphones as I got off the subway one very early morning, so, being sleep deprived, I followed Bob Dylan's command and sauntered around West Midwood but no parking meters could I find to watch. So I widened my search and found some in Fiske Terrace along Avenue H and then on the north side of Foster and, of course, Cortelyou Road was aswim with the ugly metallic monsters. But none in West Midwood. I'm not sure what, if any, significance this has, but there you have it. During my sIeepy walk, I did see a car with a parking ticket on its windshield, and it set my mind a-wandering...It was back in 1986, and I had just been air-lifted into the Parking Violations Bureau which back then was located on top of the old Wannamaker building in Greenwich Village. There had been a big BIG scandal involving the letting of very very BIG contracts and one day I found myself in a dusty dark storeroom off of the General Counsel's office. I was looking for an old contract when I suddenly found myself facing a five foot high stack of what appeared to be at first glance stock certificates. But upon closer inspection, they were bench warrants. 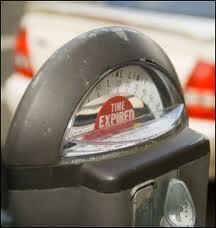 For motorists who had failed to answer parking summonses. Parking tickets used to be returnable in criminal court - until the tsunami of more serious crimes led to “decriminalization" of double-parking et al in 1970, with PVB created to process the summonses. But apparently PVB never threw out the bench warrants it had inherited, and there they sat, long past the expiration date of their enforceability. So I did what any level-headed person would do, I used white-out to erase the name and address on a warrant, typed in the name of my boss and at an appropriately embarrassing time, confronted him with his scofflaw past. The old statute-of-limitations-expired-bench-warrant-switcheroo. Surprisingly, my boss, who had also been dropped into the middle of the mess, got a big kick out of the bench warrant and had it framed as a memento of a bizarre time. After which we had all those old warrants shredded,…Hmmm. I wonder what the statute of limitations is for destroying official government records? If it’s less than 24 years, so long it’s been good to know ya, have a great holiday season and keep watching those meters!